The massive increase in e-commerce and trade, courtesy of the increase in demand, and the bulk of Online Industry giants is duly responsible for a surge in the market value of warehouses. This is driving a higher demand for more economic warehouse construction and more growth in rents for these buildings in an industrially zoned area. According to CBRE, comparing the data from the early 2000s in the United States with the recent 2012-2017 showed an increase of 147 percent in both the square footage of a warehouse and its height as well. The average warehouse clear height rose by 3.7 feet, to 32.3 feet in total. Chicago witnessed an increase in warehouse size estimated to be 134 % in the same time frame, with the average new building now at 283,366 square feet, et per CBRE analysis. Matt Mulvihill, Executive Vice president with CBRE in Chicago attributes this high demand for innovative warehouse designing to the explosive growth in the e-commerce industry. The greater the demand, greater is the space needed to store these supplies. Also, for these shipments to reach consumers in a timely manner there is a greater requirement for highly specialized equipment, storage racks and ‘last mile’ distribution methods for fast shipping. According to David Egan, global head of industrial and logistics research at CBRE, e-commerce industry is not the only factor driving the warehouse land market value, which represents only about 33% of the total industrial zone areas. The bulk of lease demands are held by companies involving conventional parties like automotive and logistics. Another factor that should be considered a main driving force is the decreased vacancy in industrial zones. Tight spaces and low vacancy creates a surge in rents and demand for larger warehouse areas. The average industrial vacancy rate of 5.2 percent in the third quarter of 2017 was the lowest on record in the United States, according to Colliers International’ s most recent industrial property report. According to reports, online supply is still behind the on-growing demands by e-consumers, with online costumers demanding faster delivery and competing trades. The location of a warehouse building, especially a last mile warehouse, is critical in providing efficient delivery timing. This factors in mainly in the larger inland industrial areas. E-commerce companies are initiating a development boom in order to catch up, this being more so for mainland industrial areas like Chicago and Atlanta. Warehouse space expanded from 170 million square feet (15.8 million sqm) in early 2017 to 222 million square feet (20.6 million sq. m) in late 2017, according to Colliers. 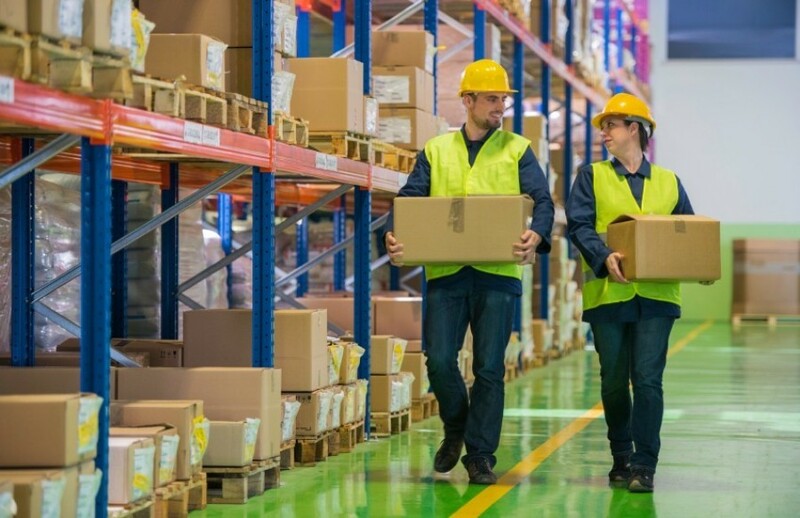 Pete Quinn, National Director of Industrial Services for Colliers predicts the industrial boom to stay consistent in the near future as the ‘E-commerce sales are growing at a rate five times faster than traditional retail sales’, he said. Recently, however, the equilibrium between supply and demand is showing signs of disturbance. According to Chicago based JLL, most of the development in the last quarter was on a speculative basis. Purchasing unused land for a potential development has led the construction aspect to outgrow the demand rate. According to JLL analysis, it could cause a temporary decline in the vacancy rate, however, lease management and proper processing can overcome the decline in the near future. Also, focus on smart development, innovative designs for warehouse spaces, more automated and high functioning distribution methods could aid in this venture. According to Aaron Ahlburn, managing director for industrial and logistics research at JLL, this speculative construction is the result of ‘a push toward high quality and very functional high-bay type of space.’ The Inland Empire, a southern California industrial giant, is the example in this case, where more than 26 million square feet (2.4 million sqm) of industrial space is under construction. In the third quarter of 2017, the market’s average vacancy rate dropped to 3.4 %, and warehouse tenants absorbed some 14.8 million square feet (1.4 million sq. m). Dedeaux Properties a Los Angeles–based industrial development firm is carrying out innovative development in conventional warehouses and last-mile logistic, which includes a 46,560-square-foot (4,300 sq. m), a 101-door warehouse that is scheduled to break ground in early 2018, and a 1 million-square-foot (93,000 sq. m) warehouse is being planned. As e-commerce is advancing rapidly and warehouse availability rate is flattening, down by almost 90%, various platforms are providing on-demand warehouse spaces which seem to be the next innovative option in conventional and logistics industrial development.